Indulge yourself in the spas and estancias (ranches) of Argentina and Uruguay. This twin-centre itinerary will also give you the chance to explore the Patagonian wilderness. You’ll then discover the town of Carmelo, Uruguay’s best-kept secret: you’ll be staying in a luxury spa resort and exploring the local wineries. When you arrive at the airport your driver will meet you and transfer you to your hotel. Evening at leisure. Today you’ll be setting off on a sightseeing tour of the city. You’ll see the trendy La Boca district, the Teatro Colón Opera House and the Plaza de Mayo (the climactic scene of Evita may spring to mind). In the evening you’ll dine in one of Buenos Aires’ best restaurants. You’ll be flying to Córdoba this morning. Your driver will meet you at the airport and transfer you to the estancia where you’ll be staying. You’ll be able to make the most of the activities on offer. These include horse riding, hiking, game hunting and attending a Tango show. You can also choose from more laid back activities like massage therapy and spa treatments. Today you’ll fly to Bariloche. When you arrive your driver will meet you and transfer you to your hotel. The setting is quite spectacular. 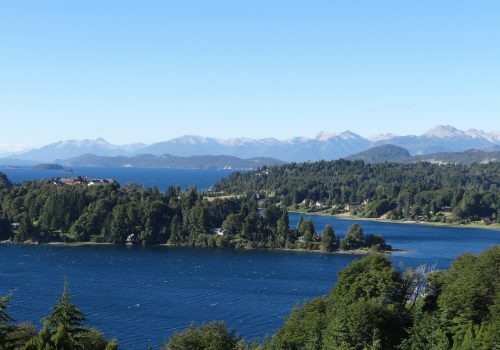 You’ll be staying within the Nahuel Huapi National Park and surrounded by mountainous Patagonian landscapes. The National Park is yours to explore. You can go biking, hiking and engage in watersports. The hotel also has a state of the art spa. Today you’ll be returning to Buenos Aires. Enjoy the fabulous nightlife but be prepared for an early start. Today you’ll be flying to Carmelo in western Uruguay. The town is surrounded by some excellent wineries. You’ll be staying in a 5-star resort and spa. Make the most of the luxury spa treatments and explore the local area. You’ll find stunning beaches, excellent food and, of course, wineries. Take a trip to the Bodega Familia Irutia winery and taste some up and coming Uruguayan wines. On your last full day you’re free to relax at the hotel and discover more of this charming town. You’ll be transferred to the airport and flown back to Buenos Aires for your return flight. To get going, please submit an enquiry below and one of our expert team will get back to you within the next 24 hours to discuss your requirements. All the prices on our website do not include flights, but we can, of course, arrange them for you and include them in your quote. Remember, there is no booking fee for using our expert team to plan and book your trip. Call the team now for a chat on +44 (0)20 7157 1570. OutOfOffice.com is a tailor-made travel company specialising in building custom travel itineraries for our clients. We also pride ourselves that all our travel experiences are also LGBT friendly. Registered Office: OutOfOfficeDotCom Ltd, Clerks Court, 18-20 Farringdon Lane, London, EC1R 3AU, United Kingdom. Copyright 2019 Out of Office — All rights reserved.